Planning a Marian Coronation is not as hard as you might think, and a May crowing ceremony is a great way to recognize Mary as the Queen of Heaven and Earth! I’ll start with the basics. The month of May is dedicated to Mary. It’s traditional to have a May crowning on May 1 (also known as May Day) but you can do it any time during May. First, figure out what Mary statue you are going to be crowning. You can try calling your parish to arrange a crowning of the Mary statue there. 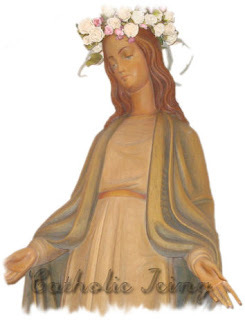 You can also crown your own Mary statue in your garden, or even a little plastic statue inside- just make sure you have or make a crown that will fit your particular statue. It’s traditional to crown Mary with flowers of some kind. If you’re looking for ideas on crafting a crown, check my May Crowning post from last year. Take the statue’s placement into consideration when planning. If you’re crowning the Mary statue at your church, you may need a step ladder to reach her head. 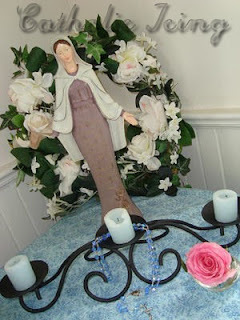 If you’re crowning a Mary statue at home, you may want to put together a simple May Altar. 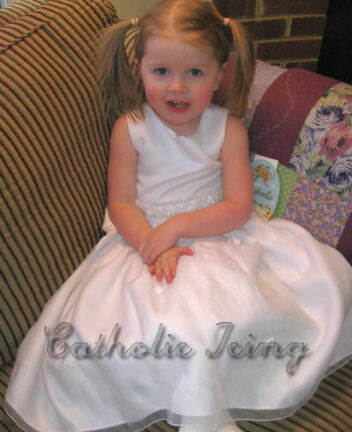 You can ask all the families attending the May Crowning to bring flowers for Mary. These can be hand picked, store bought, or artificial- no pressure. Alternately, you could provide flowers there and give one to each child to offer to Our Lady. These flowers will be placed at Mary’s feet. 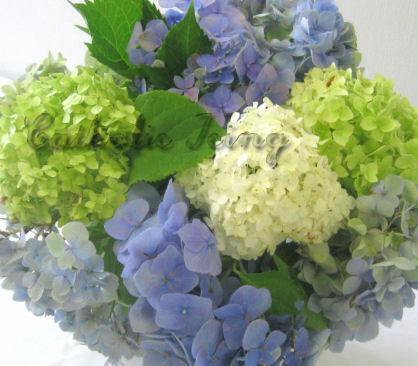 You can check out the Marian symbolism of different flowers here, but anything works, and you certainly can’t go wrong with Our Lady’s color- blue! Usually there is a procession with the crown before it is placed on Mary’s head. You can line up all the kids, and sing a song while you process with the crown. (For song ideas, scroll down). The children can all carry flowers to be placed at Mary’s feet as they reach the statue. You can either provide a vase for these flowers, or just lay them individually at Mary’s feet. After you’ve crowned Mary, it would be great to say some prayers! The Hail Mary and the Hail, Holy Queen would both be good choices. You could also pray a decade of the rosary depending on the age of the kids at the crowning. Who doesn’t love to sing a Mary song? There are so many great choices! There’s actually a song called Bring Flowers of the Rarest (Queen of May) and another called Tis the Month of Our Mother. Some other favorites include Hail Holy Queen, Immaculate Mary (Ave Maria), or Hail Mary (Gentle Woman). 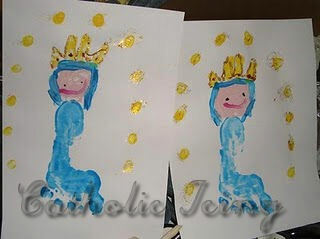 Crafts for your May Crowning- Extra Fun! If you’re looking for craft ideas for your May crowning, boy have you come to the right place! You can make Mary, Queen of Heaven Suncatchers, make my Hand and Footprint Queen Mary Craft, make a Paper Mary Statue, or check out this assortment of fun Mary Printables for kids! It’s traditional for girls to wear their First Communion or Easter dresses for the May crowning, and for the boys to wear their Sunday best as well. You may or may not choose not to have the kids dress up for a casual May crowning at your home. If you’re looking to plan a whole May crowning mass, Catholic Teacher Resources has an amazing printable May crowning layout for you! I also found a lovely May Crowning proposal from Little Flowers Girl’s Club that you can send to your priest to have a May crowning during mass, along with plans. You can find more resources for planning your May Crowning at the Catholic Toolbox, and at Catechist’s Journey. 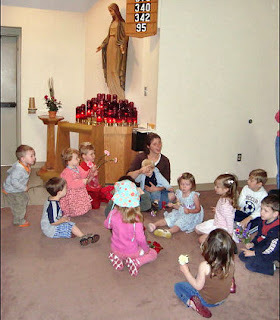 I attended my first May Crowning last year with our preschool co-op. We’re having another May Crowning with our preschool next week, and I was thinking about having a home May crowning here on Mother’s day! Thanks for sharing these great ideas! We made Mary Suncatchers last year, I’ll have to decide what to do this year. that’s really cool! as always! Brings back wonderful memories of my youth and the devoted nuns that organized our flower offerings! I was 12 yoa and got to crown our Blessed Mary at the coronation. I have had blessings to long to list and live my rosary!! What ideas are out there to include boys in the May Crowning activities? It doesn’t look like the Catholic Teacher Resource has a printable layout anymore. Did you happen to save a copy? I would love to see it as I plan the May Crowning for my school.